The Cumberland & Dumfriesshire Farmers Mart P.L.C. 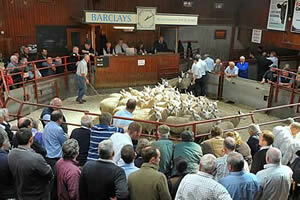 had forward 4,241 Store Lambs at their weekly sale at Longtown on Tuesday 28th September 2010. Another great show of lambs attracted more distant buyers and all classes easily maintained late high rates. Top of £62.20 for Suffolks from Oliver Farm, others £59.20 Linton; Texel £60.20 Hazelbank, £59.20 Thorniewatts, £58.20 Hollinclose; Bleu d’Maine £59.20 Prospect; Greyface £54.80 Old Hall and Woodhouselees, £54.20 Tecket; Charollais £54.20 Low Old Shield and Kirndean; Beltex £51.20 Old Hall; Blackface £49.80 Thorniewatts, £48 Town Shields, £47.20 Greensburn; Kendal Rough £44.20 Clarks Hill; Herdwick £43 Low Northsceugh; Swaledale £31 Kielder Head. Hill Cheviots (1,902) easily sold, if anything rather sharper on the week. Top of £56 Sorbietrees, others £55.50 Clerkhill and Arkleton, £54.50 Park Hill, £54 Twislehope. Overall average £52.02. The Cumberland & Dumfriesshire Farmers Mart P.L.C. had forward 80 Breeding Rams, 800 Ewes, 750 Shearlings and 1,480 Ewe Lambs at their special sale at Longtown on Tuesday 28th September 2010. A small show of 80 Breeding Rams sold to a large audience with all classes selling well, but a premium for the best rams. Suffolk and Charollais rams were in short supply. Top price of £480 for a Texel shearling from Messrs Creer, Cooilingel, Isle of Man, other from the same £400 and £360; Charollais £320 Uppercleugh; Beltex £240 Dormansteads. The 900 breeding ewes sold to a packed ring of buyers and upheld recent rates, selling to a top of £108 for two crop Suffolks from Longrow and for one crop Texels from The Close. Correct Greyface ewes to £94 Waltonwoodhead, £90 Quarryfield, £89 Netherton; Texel £98 Longrow, Quarryfield and The Height; Suffolk £70 Netherton, Easterhouse and Haythwaite Lane. The 750 shearlings were short of requirements and sold easily all day to a top of £132 for Texels from The Close and to £128 for Mules from Taylorburn. Other Texels to £126 Dormonsteads, £108 Foulshields, other Mules £126 Castlefairn and Porterstown, £124 Taylorburn; Beltex £126 Dormonsteads, £102 The Height; Cheviot Mule £123 Castlefairn, £114 Maxton; Suffolk £102 Easterhouse; Lleyn £102 The Height; Zwartbles £90 West Craigs. The Second Sale of Ewe Lambs were an excellent show for quality with the 1,000 Mules selling to £96 from Albierigg. 480 Continental and Suffolk x ewe lambs sold well with an exceptional run of ¾ Texels from A.R. Bell, Kirkton, selling to £150 and averaging £111 for 141 lambs. Other Mules to £87 Bayldon, £86 Woodside; Suffolk £78 Deuchrie, £75 Easterhouse; Zwartbles £74 West Craigs; Cheviot Mule £68 East Middle.